The in-beam Mössbauer spectroscopy facility is being installed at the Neutron guide hall of the Budapest Research Reactor. The station is operated by researchers of the Centre for Energy Research, HAS. After the commissioning the equipment will be part of the EU FP7 NMI3-II program. The instrument can be used on-line, but during reactor shutdown, activated short-lived Mössbauer sources will also be utilized. During the on-line operation a beam of guided cold neutrons produce the Mössbauer transitions continuously. 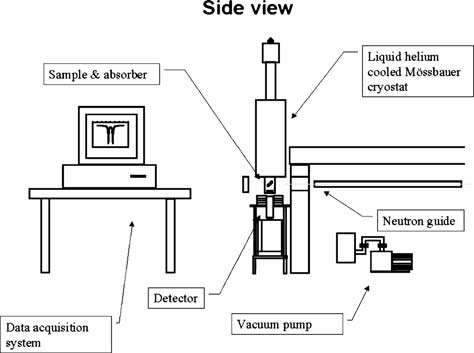 The cold neutron flux, transmitted by a focused supermirror guide is measured to be about 109 n cm−2 s−1 at the target position. The beam shutter is installed at the beginning of the 7 m long guide section to avoid the high radiation caused by the closed beam shutter. The experimental area is shielded by concrete walls from the rest of the guide system on both at the entering and at the leaving sides. Near the guide end a collimator system made of lead and 6Li-enriched polyethylene is placed in the hole of the shielding concrete walls to minimize the unwanted radiations. The diameter of the beam, passing through this collimator system, at the target position is about 1×1 cm2. The neutron beam enters through a thin vertical window (made of Mylar and beryllium) into the cryostat and leaves on its opposite side. The cryostat can be operated in the 3–360 K temperature range with liquid helium or nitrogen cooling. The maximum areas of the Mössbauer source and absorber are about 1 cm2 thus the available maximum source strength is about 1 GBq. The sample holder is fixed to the end of a steel tube, which holds the moving rod mechanics as well as the absorber at its bottom. The Mössbauer transducer (Wissel MVT 1,000) is fitted to the top of the specifically modified cryostat (Konti-IT-Cryostat-Spektro-He product of CryoVac) and an aluminum moving rod connected to the transducer moves the Mössbauer source up and down in the beam. For the acquisition of the Mössbauer spectra two detectors, a Na(Tl) and a HPGe, can be used in absorption geometry. The HPGe detector enables us to study the low energy prompt gamma spectrum in high resolution in order to be able to select the energy window for the Na(Tl) detector. The detectors can be mounted below the cryostat and perpendicular with their axis to the impinging neutron beam. The data acquisition system is equipped with an 8K channel Wissel CMCA-550 USB pulse height and Mössbauer analyzer, which can be connected to a personal computer with USB port. Transducer driving electronics, a function generator and high voltage power supplies, all placed in a NIM Bin, complete the system. A schematic drawing of the equipment is given in Figure 1. Figure 1. Schematic drawing of the in-beam Mössbauer equipment. Prospective prompt-gamma nuclei for in-beam excitation were identified. The best candidates are (40K, 56Fe, 66Zn, Gd, Er, Dy, Yb, Hf, W). We have estimated the expected event rates with the parameters of our Mössbauer system. For the mass of Mössbauer nuclei in the source and absorber we used 0.001 mol, while for the recoilless fractions we assumed 0.1 for both of them. The Mössbauer absorption cross-section was set to 10−19 cm2 in all cases. For both the source and absorber nuclei the natural abundance were taken into account. The natural elemental gamma ray production cross-sections σg were taken from our experimental results. It can be clearly seen that the rare earth elements give the smallest uncertainty for the same length of measurements. Some of the light elements can also be studied, however, in the case of potassium enriched ones absorber would be needed to achieve better statistics. Beside the prompt gamma sources we can make use of the short-lived continuously activated sources. The corresponding Mössbauer nuclei are 153Er, 166Er, 175Lu, 186Os, 191Ir, 192Ir, 195Pt and 197Au. They can also be used in-beam similarly to the prompt gamma rays. Longer half-life nuclei can be activated in the reactor and used during the reactor shutdown periods (141Pr, 127I, 129I, 181Ta, 182W). Fields of applications include: biological systems (40K prompt excitation), catalysts (193Ir, 196Pt, 197Au short-lived continuous activation), HTC superconductors (141-Pr reactor shutdown, Dy prompt activation), geological samples and magnetic layers (Gd, Er, Dy, Yb prompt and short-lived activation), the chemical behavior of the nuclear waste of 129-I (127-I reactor shutdown), corrosion in nuclear and traditional power plants (57Co, reactor shutdown) or in-beam produced 57Fe to study chemical changes induced by radiation in solid states.